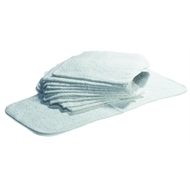 Set of 5 terry towelling cloths for Karcher Steam Cleaner floor nozzle. Five replacement cloths for floor nozzle. Lint-free, highly absorbent and heavy duty.